One summer day in 1795 Daniel McGinnis, then a teenager, was wandering about Oak Island, Nova Scotia (see Geography) when he came across a curious circular depression in the ground. Standing over this depression was a tree whose branches had been cut in a way which looked like it had been used as a pulley. Having heard tales of pirates in the area he decided to return home to get friends and return later to investigate the hole. Over the next several days McGinnis, along with friends John Smith and Anthony Vaughan, worked the hole. What they found astonished them. Two feet below the surface they came across of layer of flagstones covering the pit. At 10 feet down they ran into a layer of oak logs spanning the pit. Again at 20 feet and 30 feet they found the same thing, a layer of logs. Not being able to continue alone from here, they went home, but with plans of returning to search more. 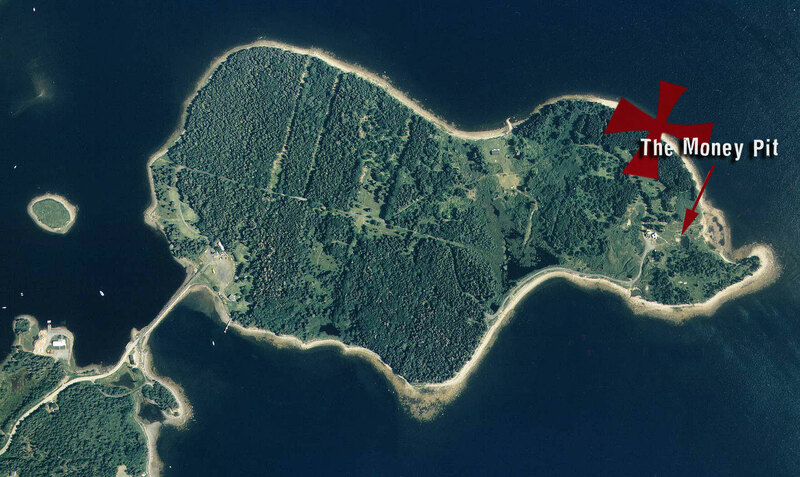 A topographical surbey photo of Oak Island. It took the three discoverers 8 years, but they did return. Along with The Onslow Company, formed for the purpose of the search, they began digging again. They quickly got back to 30 foot point that had been reached 8 years ago. They continued down to 90 feet, finding a layer of oak logs at every 10 foot interval. Besides the boards, at 40 feet a layer of charcoal was found, at 50 feet a layer of putty, and at 60 feet a layer of coconut fiber. At 90 feet one of the most puzzling clues was found – a stone inscribed with mysterious writing. Note: For more information about the stone inscription and to try your hand at translating the stone’s inscription go here. After pulling up the layer of oak at 90 feet and continuing on, water began to seep into the pit. By the next day the pit was filled with water up to the 33 foot level. Pumping didn’t work, so the next year a new pit was dug parallel to the original down to 100 feet. From there a tunnel was run over to The Money Pit. Again the water flooded in and the search was abandoned for 45 years. Another aerial photo showing the location of the dig. As it turns out, an ingenious booby trap had been sprung. The Onslow Company had inadvertently unplugged a 500 foot waterway that had been dug from the pit to nearby Smith’s Cove by the pit’s designers. As quickly as the water could be pumped out it was refilled by the sea. This discovery however is only a small part of the intricate plan by the unknown designers to keep people away from the cache. In 1849 the next company to attempt to extract the treasure, The Truro Company, was founded and the search began again. They quickly dug down to 86 feet only to be flooded. Deciding to try to figure out what was buried before attempting to extract it, Truro switched to drilling core samples. The drilling produced some encouraging results. 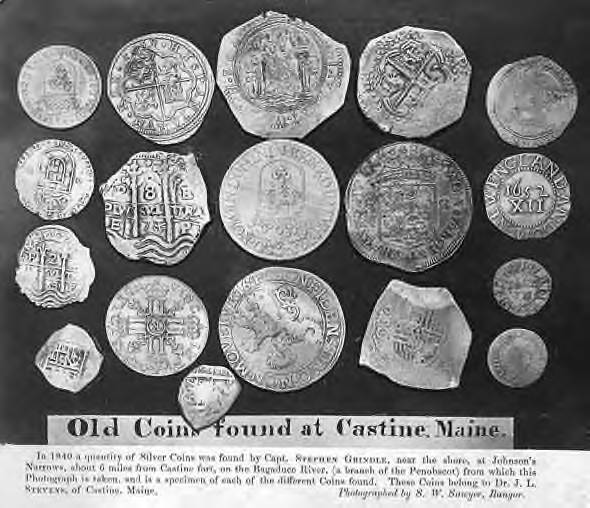 7th century Spanish coins found at one time or another at the Money Pit. At 98 feet the drill went through a spruce platform. Then it encountered 4 inches of oak and then 22 inches of what was characterized as “metal in pieces””; Next 8 inches of oak, another 22 inches of metal, 4 inches of oak and another layer of spruce. The conclusion was that they had drilled through 2 casks or chests filled will coins. Upon pulling out the drill they found splinters of oak and strands of what looked like coconut husk. One account of the drilling also mentions that three small gold links, as from a chain, were brought up. Unfortunately no one knows where they have gone. Interestingly, the earth encountered beneath the bottom spruce platform was loose indicating that the pit may have gone even deeper. A later group of searchers would find out how much deeper. The Truro Company returned in 1850 with plans to dig another parallel hole and then tunnel over to the Money Pit. Just like before, as they tunneled over, water began to rush in. They brought in pumps to try to get rid of the water but it was impossible to keep the water out. During the pumping someone noticed that at Smith’s Cove during low tide there was water coming OUT of the beach. This find lead to an amazing discovery – the beach was artificial. It turns out that the pit designers had created a drain system, spread over a 145 foot length of beach, which resembled the fingers of a hand. Each finger was a channel dug into the clay under the beach and lined by rocks. The channels were then filled with beach rocks, covered with several inches of eel grass, and then covered by several more inches of coconut fiber. The effect of this filtering system was that the channels remained clear of silt and sand while water was still allowed to flow along them. The fingers met at a point inland where they fed sea water into a sloping channel which eventually joined the Money Pit some 500 feet away. Later investigations showed this underground channel to have been 4 feet wide, 2 1/2 feet high, lined with stone, and meeting the Money Pit between the depths of 95 to 110 feet. To the Truro Company, the answer was now simple – just block off the water flow from the beach and dig out the treasure. Their first attempt was to build a dam just off the beach at Smith’s Cove, drain the water, and then dismantle the drain channels. Unfortunately a storm blew up and destroyed the dam before they could finish. An interesting note: the remains of an older dam were found when building the new one. The next plan was to dig a pit 100 feet or so inland in the hopes of meeting with the water channel underground at which point they could plug the channel. This scheme too failed. And this was the last attempt by the Truro company to uncover the secrets of Oak Island. The next attempt at securing the treasure was made in 1861 by the Oak Island Association. First they cleared out the Money Pit down to 88 feet. Then they ran a new hole to the east of the pit hoping to intercept the channel from the sea. The new shaft was dug out to120 feet without hitting the channel and then abandoned. The bottom fell out. Water rushed into the shafts and the bottom of the Money Pit dropped over 15 feet. Everything in the Money Pit had fallen farther down the hole. The big questions were why and how far? Over the next several years different companies tried to crack the mystery unsuccessfully. They dug more shafts, tried to fill in the drain on the beach, built a new dam (which was destroyed by a storm), and drilled for more core samples. They met with little success. In 1893 a man named Fred Blair along with a group called The Oak Island Treasure Company began their search. Their first task was to investigate the “Cave-in Pit”. Discovered in 1878 about 350 feet east of the Money Pit, the cave-in pit appears to have been a shaft dug out by the designers of the Money Pit perhaps as a ventilation shaft for the digging of the flood tunnel. It apparently intersected or closely passed the flood tunnel. While it was being cleared by the Treasure Company it started to flood at a depth of 55 feet and was abandoned. Over the next several years The Oak Island Treasure Company would dig more shafts, pump more water, and still get nowhere. In 1897 they did manage to clear out the Money Pit down to 111 feet where they actually saw the entrance of the flood tunnel temporarily stopped up with rocks. However, the water worked its way through again and filled the pit. The treasure company then decided that they would attempt to seal off the flow of water from Smith’s Cove by dynamiting the flood tunnel. Five charges were set off in holes drilled near the flood tunnel. They didn’t work. The water flowed into the Money Pit as rapidly as ever. At the same time a new set of core samples were drilled at the pit itself. The results were surprising. At 126 feet, wood was struck and then iron. This material is probably part of the material that fell during the crash of the Pit. On other drillings the wood was encountered at 122 feet and the iron was missed completely indicating that the material may be laying in a haphazard way due to the fall. Between 130 and 151 feet and also between 160 and 171 feet a blue clay was found which consisted of clay, sand, and water. This clay can be used to form a watertight seal and is probably the same “putty”; that was found at the 50 foot level of the Pit. The major find was in the gap between the putty layers. A cement vault was discovered. The vault itself was 7 feet high with 7 inch thick walls. Inside the vault the drill first struck wood, then a void several inches high and an unknown substance. Next a layer of soft metal was reached, then almost 3 feet of metal pieces, and then more soft metal. When the drill was brought back up another twist was added to the whole mystery. Attached to the auger was a small piece of sheepskin parchment with the letters “vi”; “ui”; or “wi”; What the parchment is a part of is still in question. More convinced than ever that a great treasure was beneath the island, The Treasure Company began sinking more shafts in the attempts to get to the cement vault. They all met with failure due to flooding. In May of 1899, yet another startling discovery was made. There was a second flood tunnel! This one was located in the South Shore Cove. The designers had been more ingenious and had done more work than previously thought. Though this find certainly strengthened the case that something valuable was buried below it didn’t bring anyone closer to actually finding the treasure. Blair and The Oak Island Treasure Company continued to sink new shafts and drill more core samples, but no progress was made and no new information obtained. Between 1900 and 1936 several attempts were made to obtain the treasure. All met with no success. In 1936 Gilbert Hadden, in conjunction with Fred Blair, began a new investigation of the island. Hadden cleared some of the earlier shafts near the Pit and made plans for exploratory drilling the next summer. However, he made two discoveries away from the Pit. The first was a fragment of a stone bearing inscriptions similar to those found on the inscribed stone discovered at the 90 foot level of the Money Pit. The second discovery was of several old timbers in Smith’s Cove. These timbers seem to have been from the original designers due to the fact that they were joined using wooden pins rather than metal. As will be seen later these timbers were only a small part of a much larger construction. The next treasure hunter was Erwin Hamilton. He began his search in 1938 by clearing out previous shafts and doing some exploratory drilling. In 1939 during drilling two more discoveries were made. The first was the finding of rocks and gravel at 190 feet. According to Hamilton they were foreign and therefore placed there by someone. The second finding came after clearing out an earlier shaft down to 176 feet. At this point a layer of limestone was encountered and drilled through. The drilling brought up oak splinters. Apparently there was wood BELOW the natural limestone. In 1959 Bob Restall and his family began their attack on the island which ultimately proved tragic. His one discovery was made on the Smith’s Cove beach while attempting to stop the drain system. He found a rock with “1704” inscribed on it. Though others believed it was prank left by a previous search team, Restall believed it was from the time of the original construction. In 1965 tragedy struck. While excavating a shaft Bob passed out and fell into the water at the bottom. His son, Bobbie, attempted to rescue him as did two of the workers. All four apparently were overcome by some sort of gas, perhaps carbon monoxide from a generator, passed out and drowned. Bob Dunfield was the next to take on the island. In 1965 he attempted to solve the problem with heavy machinery – bulldozers and cranes. He attempted to block the inflow of water at Smith’s Cove, and may have succeeded. Then on the south side of the island an trench was dug in the hope of intercepting the other water tunnel and blocking it off. The flood tunnel wasn’t found, but an unknown refilled shaft was found, possible one dug by the designers of the Pit. The shaft apparently went down to 45 and stopped, its purpose is unknown. Dunfield’s other findings were based on drilling. It was determined that at 140 feet there was a 2 foot thick layer of limestone and then a forty foot void. At the bottom of the void was bedrock. This information matched with a drilling done back in 1955. There seemed to a large, natural underground cavern, something apparently common with limestone around the world. Daniel Blankenship, the current searcher, began his quest in 1965. In 1966 he dug out more of the original shaft found by Bob Dunfield in 1965. It turned out that the shaft did go beyond 45 feet. Blankenship found a hand-wrought nail and a washer at 60 feet. At 90 feet he met a layer of rocks in stagnant water. He assumed this was part of the south water tunnel but couldn’t explore further because the shaft could not be stopped from caving in. A pair of wrought-iron scissors were discovered in 1967 buried below the drains at Smith’s Cove. It was determined that the scissors were Spanish-American, probably made in Mexico, and they were up to 300 years old. Also found was a heart shaped stone. 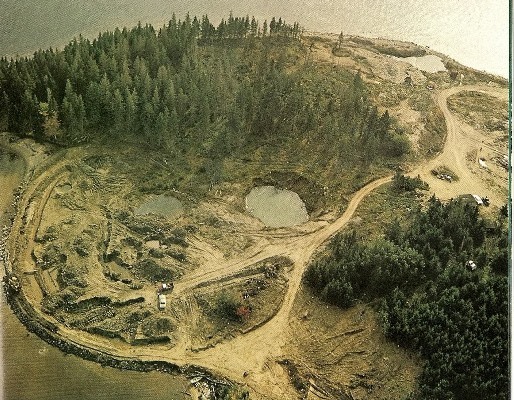 Smith’s Cove revealed some more secrets in 1970 to Triton Alliance, a group formed by Blankenship to continue the search. While Triton was building a new cofferdam they discovered the remains of what appeared to be the original builders’ cofferdam. The findings included several logs 2 feet thick and up to 65 feet long. They were marked every four feet with Roman numerals carved in them and some contained wooden pins or nails. The wood has been carbon dated to 250 years ago. The western end of the island has also revealed several items. Two wooden structures, along with wrought-iron nails and metal straps were found at the western beach. Nine feet below the beach a pair of leather shoes were unearthed. The next major discoveries came in 1976 when Triton dug what is known as Borehole 10-X, a 237 foot tube of steel sunk 180 feet northeast of the Money Pit. During the digging several apparently artificial cavities were found down to 230 feet (see: drilling results). A camera lowered down to a bedrock cavity at 230 feet returned some amazing images. At first a severed hand could be seen floating in the water. Later three chests (of the treasure type I would presume) and various tools could be made out. Finally a human body was detected. After seeing the images, the decision was made to send divers down for a look. Several attempts were made but strong current and poor visibility made it impossible to see anything. Soon after the hole itself collapsed and has not been reopened. Blankenship and Triton still continue the quest. Click on the logo to discover my novels. Thank you. Save Bala Falls! Click on the picture of Bala Falls to sign the petitions. Thank you. The Bala falls is the one and only iconic heritage of the charming, historic town of Bala, Ontario. It has been used as a portage by Native voyagers on their way to Lake Couchiching and back, as well as fur traders, and explorers. Its significance lies in its connection to both the past and present, and once gone it cannot be replicated or replaced. However, now the province of Ontario, together with a ‘for-profit’ outfit, is pushing through a plan to destroy Bala Falls as we know it. Why? For the purpose of making more money. So how much is heritage worth? To a cynical, uncaring, avaricious government, apparently not much. But to the people of Bala it is priceless. Please sign this petition and pass it on. Thank You.